"This time of the year with this heat, most of these lakes and ponds look horrible and RemediPro is an easy, cost-effective solution," said Tony Arro, Director of Sales - Specialty Products at Brookside Agra. "The 5-strain bacillus blend in RemediPro was carefully selected, in studied proportions, based on their enzymatic production," said Arro. "The microbes introduced through RemediPro safely ingest carbon, phosphorous, potassium and nitrogen at an accelerated rate, which limits the organic loading available and improves water quality." Brookside Agra conducted a study on the effects of RemediPro on organic build-up in a 1.5 million gallon (approx. 1.5 acres) pond. The pond contained stagnant water with no movement or aeration and high organic load on top of the surface. Attempts to clear the water for two months prior to the study using a competitor's biological product was unsuccessful. Brookside Agra treated the pond with RemediPro for eight weeks between June and August. 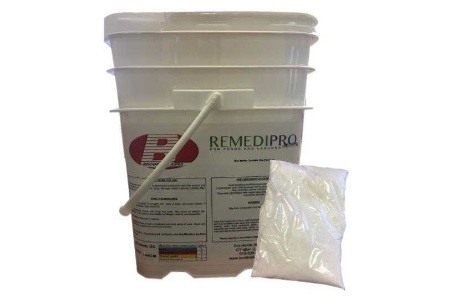 The initial shocking dosage consisted of five pounds per day of RemediPro using the water soluble packets, delivered one in the middle of the pond and one in each of the pond's four corners. Between 3-6 weeks into the treatment, the dosage was dropped to five pounds of RemediPro applied to the pond in the same manner every other day. For weeks seven and eight of the study, five pounds of RemediPro was applied twice each week in the same specified manner. At the end of the eight-week study, RemediPro was proven to reduce the water's initial COD reading of 850 ppm to 300 ppm and the water was clear of any surface organic matter. In a second study, Brookside Agra tested RemediPro's effects on a two-million-gallon-per-day, municipal equalization tank at a septage receiving facility. The tank, which was drained every night, was thick with fats, oils and greases (F.O.G.) and was creating a nuisance odor. The only cost effective, safe and feasible option for clearing the tank and decreasing the odor was using RemediPro. Brookside Agra is a global fifth-generation, family-owned business based in O'Fallon, IL that manufactures and distributes a variety of research-proven, all-natural products for specialty feeds; animal health and production; agriculture and the environment; and commercial, industrial and household use. For more information, visit www.brookside-agra.com.